I know I've mentioned before that we have been updating our home since we purchased it almost 5 years ago. One thing I have been doing is adding more wall decor. Aside from my husband's collections, our walls are pretty bare. So we definitely needed a little pop of color and design on our walls. We usually take on one room per year and this year, it's our dining room's turn. Our plans are to remove the drop ceiling, install chandelier lighting in place of the ridiculous fluorescent bulbs that are there now (who's idea was that?! ), install new, darker hardwood flooring, and of course, get rid of the hideous paneling and update with fresh new walls in a neutral paint color. Naturally, we will be busy this summer, but I didn't want to put all that hard work into it, and still have bare walls. I believe carefully chosen decor really makes the room. So when I was contacted by Photowall for a collaboration, I thought I would check them out. Photowall offers a huge variety of canvas prints as well as wall murals. Initially I considered a mural because our home's new theme is Tuscany and I knew a mural would really kick up the value of our home as well as just look a lot nicer overall. However, I realized a mural would have to wait until the room had been completed and I wanted to enjoy the beautiful artwork now. So I chose a lovely canvas print called A Taste of Napa Valley. You can choose from many prints, searching by category, artist, color, or even upload your own photo! 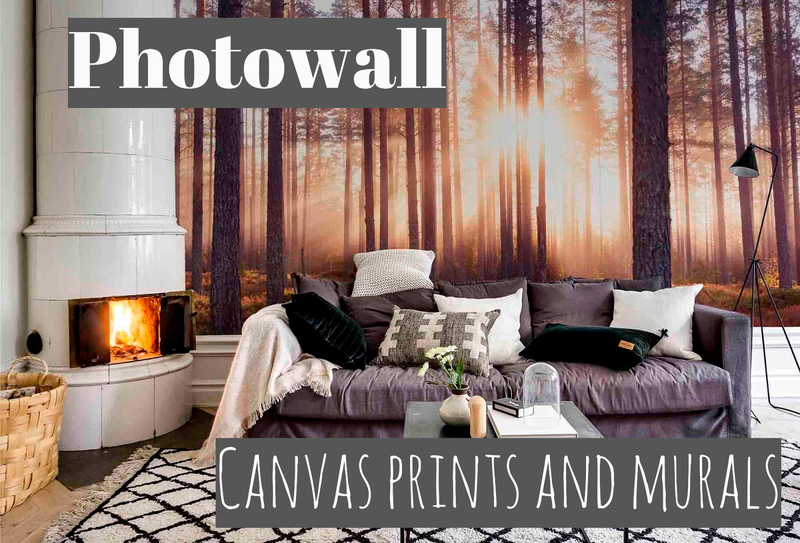 Consider the fact that you can make an entire wall mural or large canvas print of a family photo, or a beautiful scenic photo taken on your last vacation. The possibilities are endless. I just searched for wine and grapes in the search bar and a lot of really great prints popped up. That's where I found A Taste of Napa Valley. When ordering a canvas print, you have the option of adding a wooden frame, or you can purchase the print by itself, no frame included. I opted for the frame. Printing time was lightening fast and so was shipping. I'm not kidding, I had the package in my hands a mere 3 or 4 days after ordering. It didn't take long at all. When it arrived, of course the print was rolled up, but packed very well along with the frame pieces in a box. I have never ordered something like this with a frame before, so I had expected the frame to be one where I would put the frame together and the wrap the print around it and staple it. I have other canvas prints that I have purchased in stores already framed and that's how they came. Instead, these frames are much better! You lay the canvas flat, peel off the backing of the frame piece, and stick it to the edge of the canvas. I wish I had got video of this process so you could see how quick and easy it was, but I ran to take the garbage out and my husband already had half of it done for me. Once all the frame pieces are stuck on, you roll the frame inward and secure with the braces that are provided. It stretched the canvas for you and gives a very nice edge. No ugly staples like my store bought canvas prints. It also came with a sturdy hanger. My husband was rather impressed and was obsessed with how simply it was. The entire thing took maybe 10 minutes, and it probably would have taken less time than that, but he stopped once to help my son with something. The print itself is magnificent. I forgot to mention that when choosing whether or not to add a frame, you can choose your own measurements. This particular one I chose to have printed in 23" x 15" and it was the perfect size. It goes great with the decor I already have, and will look even better once the dining room is finished, walls painted, and I add some wall sconces on each side of the photo. We absolutely LOVE it! So much so, that we are definitely ordering again to spruce up walls in other rooms as well. We have a huge area of wall space going up our stairs, with very high ceilings, that would look incredible with a mural. I'm even considering the possibility of a ceiling mural. Maybe a space themed ceiling mural in my son's room? Who knows, but the possibilities are endless and I cannot wait to more Photowall prints to my home!